Last week Paypal acquired Hyperwallet, a digital platform that allows businesses to make mass payments (typically more than 1,000 at a time) to multiple recipients on different countries in different currencies. Hyperwallet has a solid customer base but a $400m price suggests PayPal is also buying a team and a platform too. According to Hyperwallet CEO, Brent Warrington, “Combining Hyperwallet’s advanced payout capabilities with PayPal’s scale will bring increased value to both Hyperwallet’s and PayPal’s customers.” At a time when everyone seems to run a “side-gig,” processing mass payments seems to be the next “hot thing” in the international payments world. But is it all it’s cracked up to be? 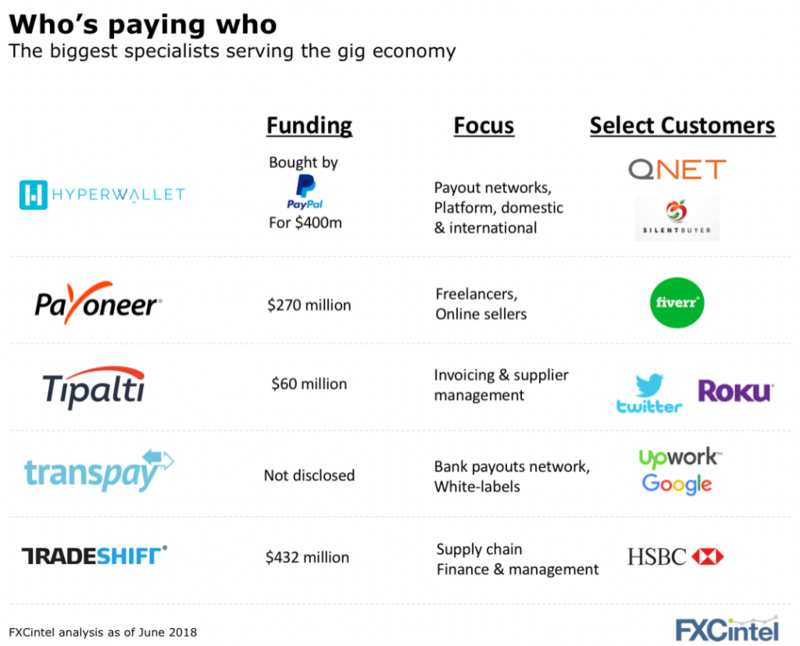 Companies who provide mass payment solutions for the gig economy are split into two groups. The bigger specialists (shown above) have put this service at the core of their business. At a time when speed and cost are being touted as the drivers of payment innovation, mass payments differs in that perfect execution (of thousands of payments simultaneously) and certainty of delivery are what count most. Outside of the specialists, many international payment generalists from Western Union Business Solutions to HiFX to TransferWise offer “mass payments.” Some groups have real technology backing this up, others are still stuck in an excel sheet batch payment manual entry process. Where differentiation begins to kick in is how a company uses mass payments to offer other (often more profitable) services. Tipalti for example focuses on invoice finance and credit. Transpay white-label’s its rails and Tradeshift is trying to solve the supply chain side. But are the specialists and generalists right to put so much energy into this space? One question that’s important for understanding the current market dynamics is why have international payment companies only now begun jumping into the market? To date, FX margins and international payment fees have not been a crucial part of the mass payment business model. Many mass payment clients have been domestic organisations, such as gig-economy platforms like Task Rabbit that focused exclusively on the US market during it’s first five years. However, the percentage of US workers classified as independent contractors (i.e., “gig” workers) has actually declined recently, representing 6.9% of the workforce in 2017 versus 7.4% in 2005 according to the Bureau of Labor Statistics. This stagnation may mirror the evolution of many gig platforms themselves, from domestically focused organisations to international companies. As these platforms have matured, they have expanded into new markets and hired foreign contractors. Other platforms such as Upwork and Fiverr have become increasingly popular for data gathering and basic research. This trend has been facilitated by countries such as India and the Phillippines which have large (and growing) contract workforces in place. In turn, the expansion of gig platforms into international markets and the outsourcing of research and data tasks has created greater demand for international mass payment solutions. And because many of these platforms prioritise payment reliability and accuracy over FX cost, many international payment companies have sensed a lucrative opportunity. With the US at full employment and outsourcing becoming easier, the winds appear to be in their favour. But in a strange world of trade wars and tariffs, it hard to predict what might come next.